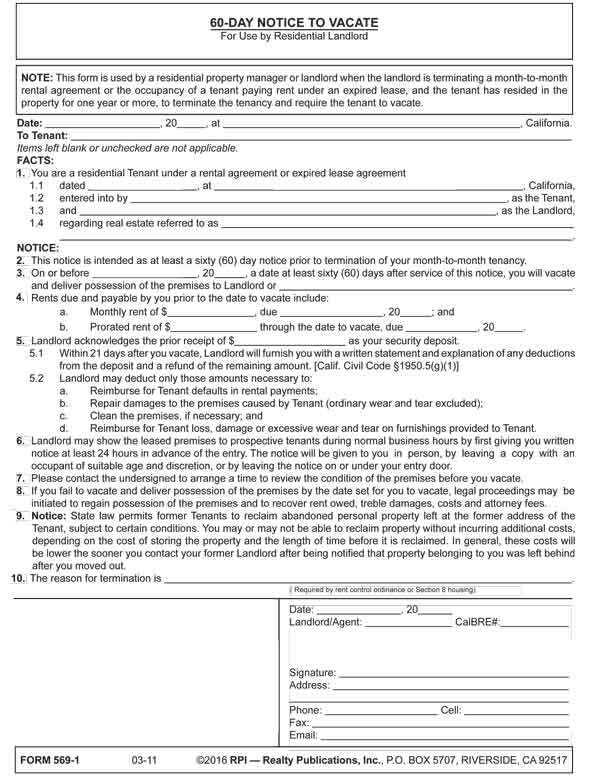 This form is used by a residential property manager or landlord when the landlord is terminating a month-to-month rental agreement or the occupancy of a tenant paying rent under an expired lease, and the tenant has resided in the property for one year or more, to terminate the tenancy and require the tenant to vacate. a statement notifying residential tenants of their right to reclaim abandoned personal property. If a tenant serves the landlord or property manager with a 30-day notice to vacate, but fails to vacate the residence after expiration of the notice, they become a holdover tenant unlawfully in possession. The tenancy has been terminated by the tenant’s notice and with it the right to occupancy. The landlord may immediately file a UD action to evict the tenant. No further notice to quit is required since the tenancy has already been terminated. A notice to vacate may be served at any time during the month. posted in a conspicuous place on the leased premises and mailed by certified or registered mail. Most properly completed notice to vacate forms give a specific date by which the tenant needs to vacate, on or before at least 30 days after service of the notice. The day is not left to chance when filling out the notice and, as a practical matter, not set as a weekend day or holiday. When a residential rental property is located in a rent control community, the landlord has less discretion to terminate tenancies and evict tenants with a notice to vacate. the landlord or a relative will occupy the unit. A landlord and their property manager of a property subject to residential rent control need to be aware of local restrictions placed on landlords for the eviction of tenants. Exceptions exist. If a tenant’s unit is subject to rent control, the landlord needs to state a good cause for terminating the tenancy. failure to pay rent or any other financial obligation due under the lease agreement beyond any grace period. improper because of the landlord’s failure to maintain the property in a habitable condition.